“I want to welcome everyone to this celebration of joy! Welcome to this celebration of the free! What we celebrate today are not the particularities of race and creed, but the universality of liberty. And the survival and success of the frontline member of the family of free nations in the face of constant existential threat. “I want to address a few particular words to the young people here. No, I am not going to tell you that you are the guarantors of tomorrow. You already know that. I am here to tell you that you are the surety of today! And you are not alone. In Quebec today there are varieties of opinion on all manner of issues. They are expressed with passion in the free battleground of ideas. And that is a good thing. Many of these opinions we don’t like. Some of you have faced many taunts of nullification and interposition expressed with inappropriate ferocity. But you responded as democrats, with reason and engagement. You need to know you are not alone. 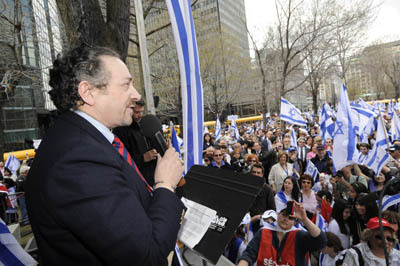 Israeli Consul-General Yoram Elron hailed the participation of 13,000 joyous people at the massive downtown rally yesterday celebrating Israel’s 62nd anniversary of independence.The weather was kind to organizers, with near summer-like weather that had followed several days of dampness and much rain. Rally host Beryl Wajsman, editor of The Suburban, welcomed participants to the “celebration of joy and of the free” and told young participants the event is “...very much your celebration.What we celebrate today are not the particularities of race and creed, but the universality of liberty,” he said. “And the survival and success of the frontline member of the family of free nations. 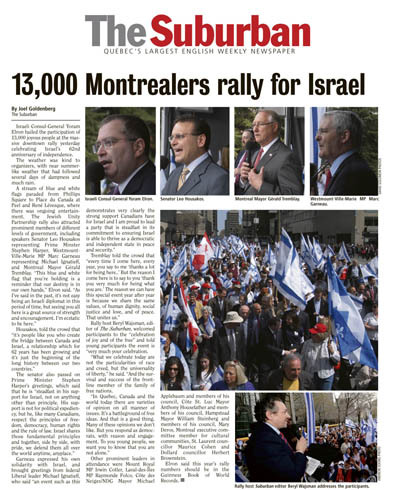 Other prominent leaders in attendance were Mount Royal MP Irwin Cotler, Laval-des-Îles MP Raymonde Folco, Côte des Neiges/NDG Mayor Michael Applebaum and members of his council, Côte St. Luc Mayor Anthony Housefather and members of his council, Hampstead Mayor William Steinberg and members of his council, Mary Deros, Montreal executive committee member for cultural communities, St. Laurent councillor Maurice Cohen and Dollard councillor Herbert Brownstein. Elron said this year’s rally numbers should be in the Guinness Book of World Records.